← Friday 4th September 2015 – And off we go again! Saturday 5th September 2015 – Book signing at a charity summer fair in Croydon. Every year a lovely couple of friends of mine and Mark’s always support a couple of local charities and have a fair to bring everyone together. This will be the second time I’ve been signing my books at their events, usually we’ve been shopping. It was a great day. The weather stayed dry, and even the sun made a brief appearance. I signed loads of “Lottie and Dottie Sow Carrots” and “Lottie and Dottie Sow Sunflowers” books and got chatting to lots of people about gardening and what I had on display (all the produce I took I grew myself of course). I had a lovely discussion with a little 9 year old girl who (well I thought) had the same colour hair as me, but according to her mine was “orange” and hers was “red”!! That put me in my place straight away. She was very sweet though and her parents were quite happy for us to discuss this for over 10 minutes. I also handed out lots of leaflets regarding the gardening events that I do for KS1 or below and people seemed very interested. I really want to be able to do more gardening events with schools, it’s so much fun, and the little ones learn so much. Congratulations to John and Dorelle for such a wonderful day, I hope that you were able to raise so much for the charities that you supported this year. And I hope your lawn doesn’t look too rough now. My display!! 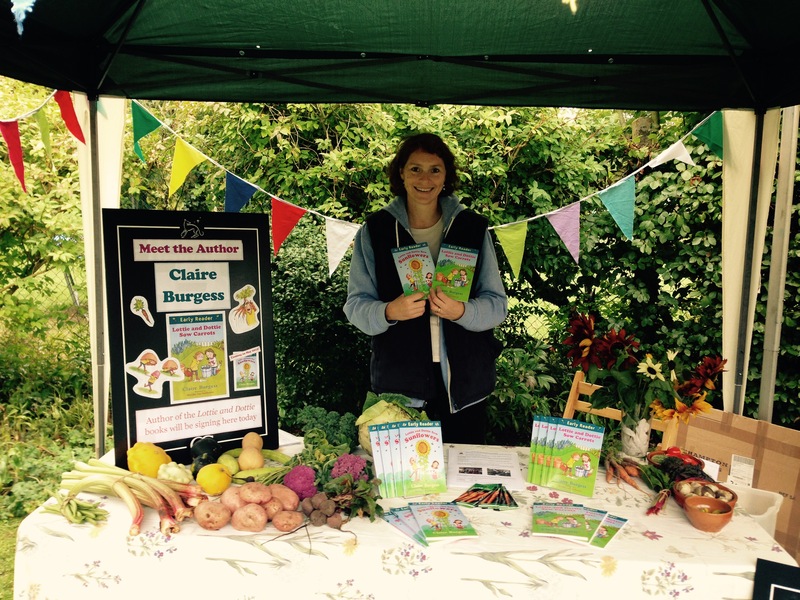 Come and buy a signed copy, perfect for those learning how to garden and read. This entry was posted in Uncategorized and tagged claire's allotment, Lottie and Dottie sow carrots, Lottie and Dottie sow Sunflowers. Bookmark the permalink. 2 Responses to Saturday 5th September 2015 – Book signing at a charity summer fair in Croydon.